We wake to the aroma from grogue stills and sound of children’s laughter as they pass on the way to school. Hetty picks us up in a mini bus with a driver who supports Liverpool FC. We like him despite this. Our route starts on the coast beside a pig farm. A large stone bench seems ideal for sorting ourselves out before setting off, until Hetty tells us it’s where coffins are laid before being carried to a church on the mountain top above us. Climbing through narrow terraces and along narrow rocky paths, Hetty regales us with tales of her granny, a wonderfully determined woman. 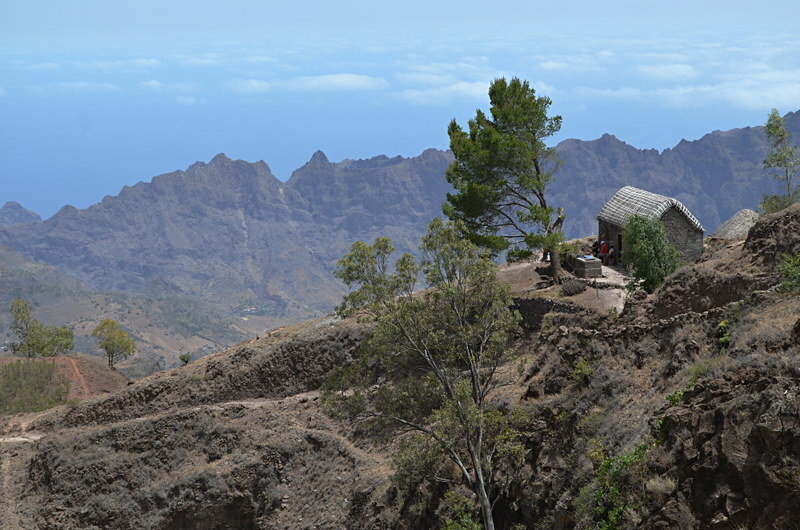 Our routes aren’t particularly long, but the Cape Verde heat means we take things slowly. We cross ravine after ravine, passing stone huts, coffee beans drying in the sunshine and dragon trees. A small boy joins us for a section, eyeing us with curiosity but speaking not one word. Lunch is another of Hetty’s delicious homemade affairs, served in a shaded copse where a girl from a nearby hamlet brings a flask of strong, black coffee. Our day ends with a visit to Hetty’s house where we’re introduced to her husband and an army of cats and kittens. We sit, chatting, on tree trunk seats beside a chunky table in an outdoor covered terrace where Hetty dishes up stews cooked in a huge pot resting on two rectangular stones. Another day brings a new guide, Nicolai, the first male guide we’ve had. It’s a 15 minute trek to the road where we get picked up. Female porters carry our cases on their heads, a throwback to another era. Nicolai is late, giving me the chance to have a nosy around a grogue still beside the road. One man works the still, he smiles as I enter, unconcerned by my presence, and pours a caramel-coloured liquid into a plastic barrel atop a stone oven. 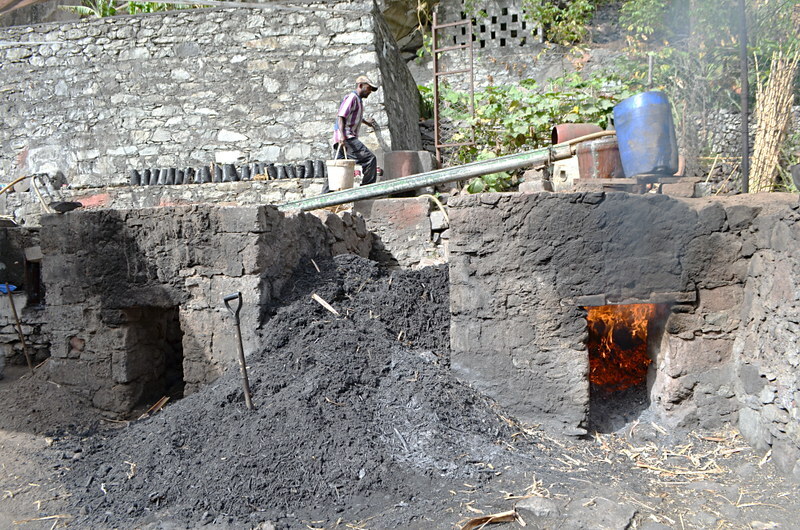 This, and a dozen other like it, is where the aroma of the valley comes from. 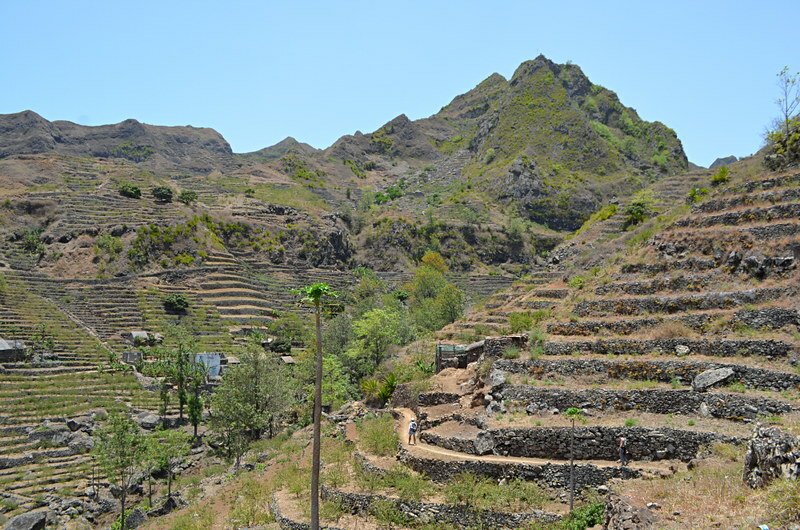 An apologetic Nicolai finally arrives and we travel by minibus along cobbled main roads to climb to the top of Santo Antao where we begin our descent to the Pedracin Village, our next hotel. 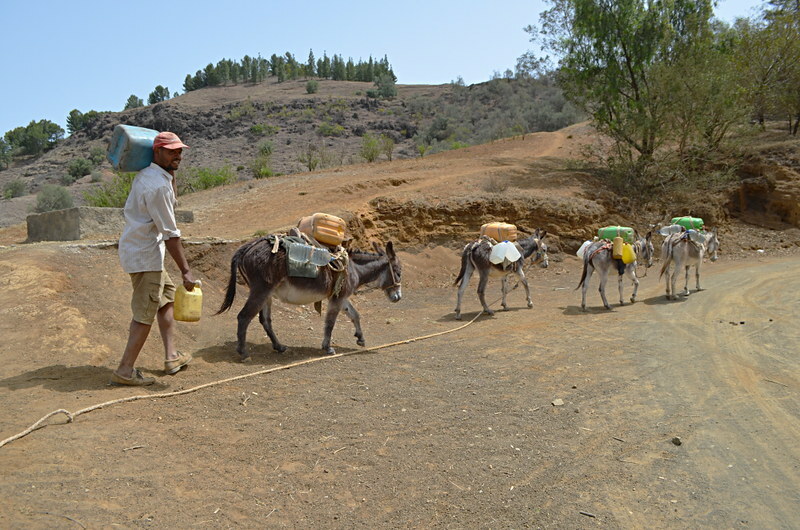 The path starts beside a watering hole where men fill up containers harnessed to teams of mules. Some don’t have any humans leading them. They head up to the watering hole, have their containers filled and toddle back home all on their own. We head along sandy paths skirting gentle mounds where the red earth is broken by pine trees and lone stone huts with thatched roofs. Some women invite us to stop and watch them pound grain. I ask Nicolai if I should give people a few coins in situations like this. The suggestion shocks him. 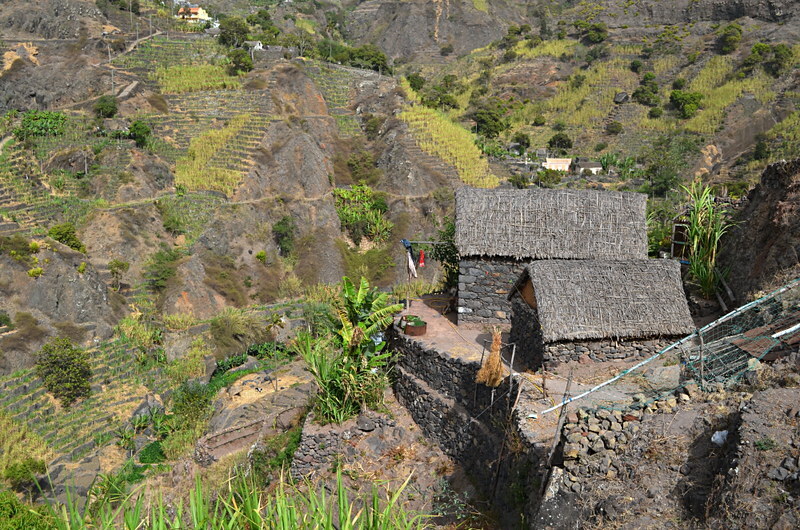 When people invite you into their homes on Santo Antao it is out of friendliness, nothing more. Nicolai laughs a lot. He has a more frivolous manner than our female guides but is equally informative in his own way. 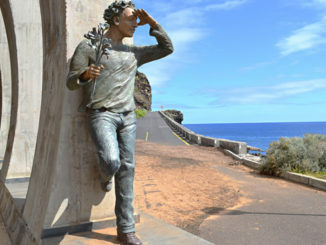 He points out agave at the entrance to houses, placed to ward off evil spirits. We stop to help an old man who’s trying to load a mountain of branches on to his back whilst his mule remains just out of range. The man insists it’s not a heavy load, but when Nicolai tries to lift it himself his knees buckle, causing him to collapse in heaps of laughter. Eventually our path descends to a scattered collection of huts where we have lunch and drink mint tea at a house belonging to a relative of Nicolai. A little boy wears a CD Tenerife shirt. I guess it shouldn’t be a surprise given the two archipelagos aren’t that far from each other, but it is. By late afternoon we reach Pedracin Village, which occupies another super spot. 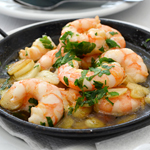 We like it immediately, it oozes Cape Verdean hospitality. We’re welcomed with fresh orange juice and a couple of grogues before we order a couple of Super Bocks and settle into seats on a terrace overlooking the luscious valley. Unfortunately the sun has just left the small swimming pool beside the terrace otherwise we’d celebrate our arrival with a cooling dip. 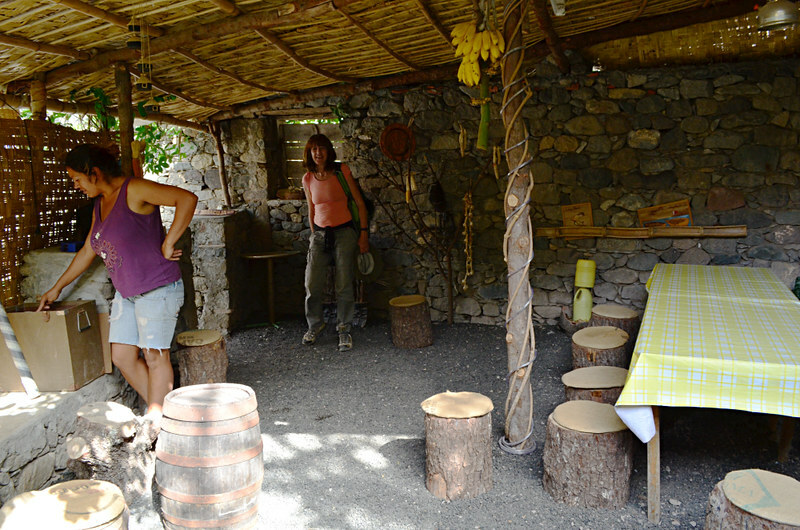 Rooms are in small cottages and are quite basic but comfortable. 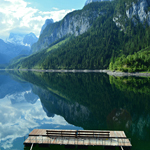 Dinner is in an attractive wooden cabin styled dining room and consists of bowls of fish, meat and vegetables. It’s all very casual; a relaxing place to chill out after exploring the surrounding countryside. We’re sorry to leave Pedracin Village after only one night. A couple of residents peacocks seem to enjoy flashing their rather sparse tail feathers at us whilst we wait for Nicolai to pick us up for a coastal route which skirts the base of cliffs and passes villages perched on the edge of ravines. It’s a very different route from our inland trails, as is lunch which is a veritable feast of a medley of fish, fruit and vegetable dishes in a nameless restaurant overlooking the sea. Without a guide, we’d never have found it. 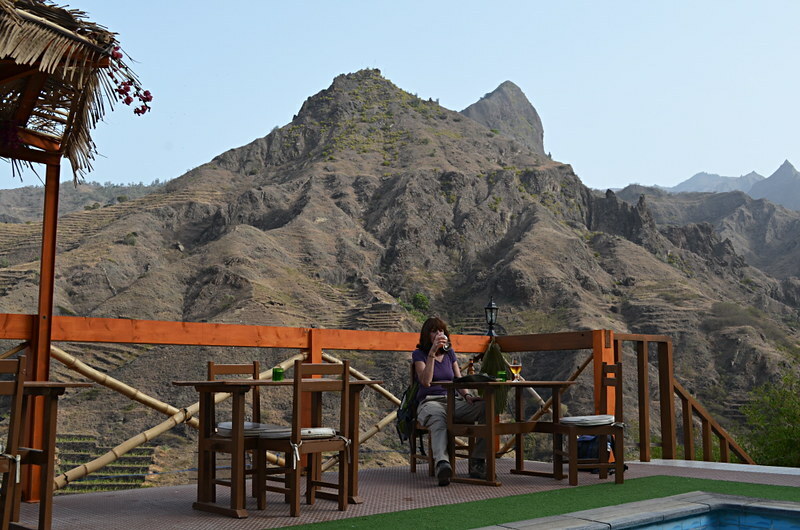 We say goodbye to Nicolai at our final Santo Antao destination, Kolina d’Sol in Ponta do Sol. Ponta do Sol is unlike the other places we’ve stayed, there’s a feel it’s been developed for an audience that hasn’t quite materialised. 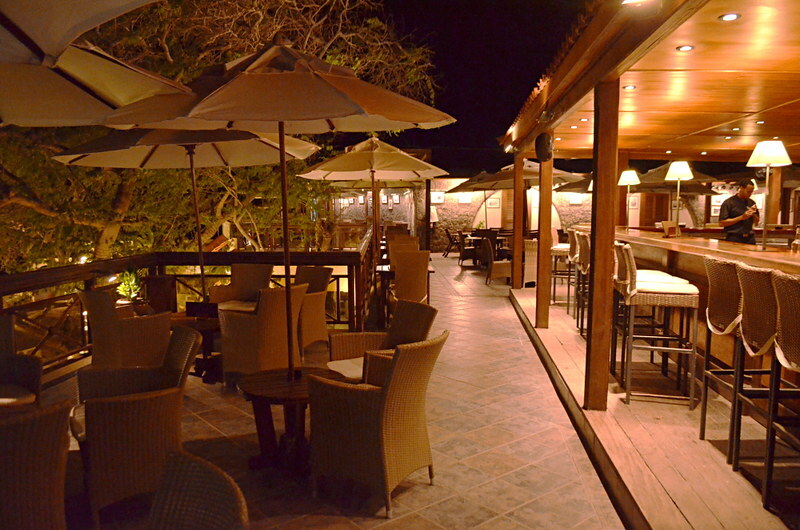 The hotel is clean and comfortable with a nice rooftop dining area. It’s 300m from the older part of the town, which is typically colonial and a good place to grab a beer as the sun sets… which is exactly what we do. 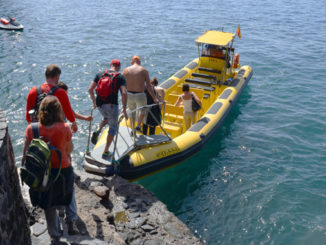 Ponta do Sol’s personality grows on us, there’s a good vibe to the place and dinner of fish and piri piri chicken listening to a lively group of local musicians serenading local girls is a deliciously fun way to end our time on Santo Antao. A savoury omelette whilst watching goats climb palm trees sets us up for the trip back to Sal via San Vicente. Travel timings mean we get to spend time in Mindelo again which is no hardship. We have coffee and cake in an eclectic little cafe which seems to worship Barack Obama and someone called Tchiss Lopes equally. 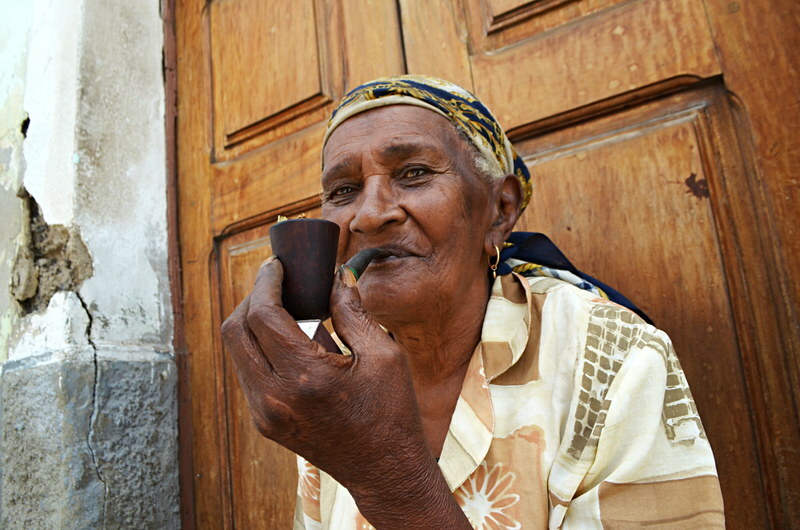 We track down a music shop to buy a couple of CDs, including Cesária Évora, and I take a picture of a woman smoking a pipe, another feature of Mindelo. 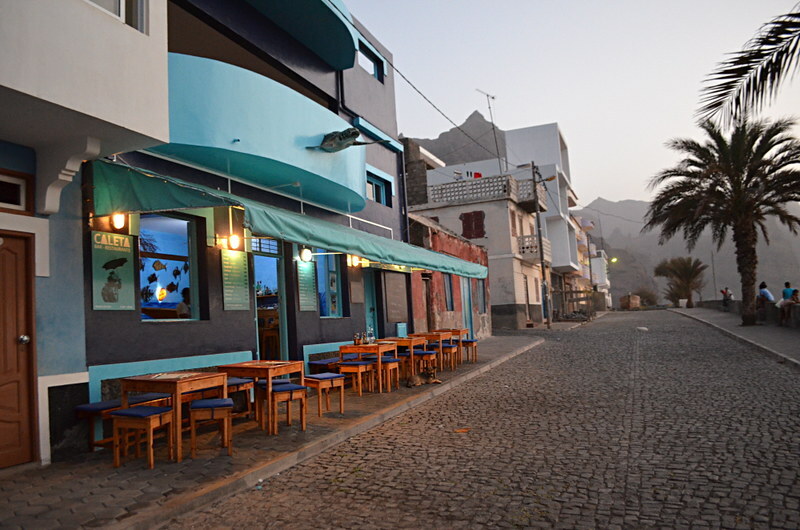 It’s easy to lose time in Mindelo, a place we’d like to get to know better. Our flight back to Sal touches down after dark. We’re booked into the Hotel Morabeza, an attractive and stylish low-rise hotel behind the beach in the centre of Santa Maria. Even though it’s a small hotel it feels quite big compared to the homely places we’ve stayed elsewhere, but it’s actually nice to stay somewhere there’s space to be anonymous. Plus it’s got a decent restaurant and good bars. After hopping across three islands in the course of a day it’s exactly what we need to chill out before popping on the plane back home. We didn’t know what to expect from Cape Verde. What we found had us hooked on the archipelago’s charms and made us hungry to explore other Cape Verde islands. 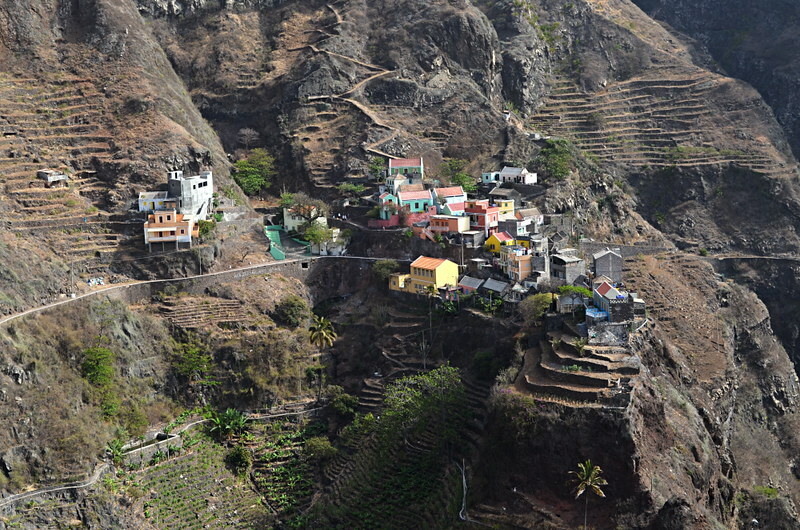 What we definitely didn’t find was the Cape Verde that dominates the online pages of Tripadvisor’s travel forum.